Quantities may be halved for 2-3 people. Place the potatoes in a saucepan and cover with water. Bring to the boil, lower the heat and simmer until the potatoes are soft. Drain the potatoes and mash with a little semi-skimmed milk and butter. Remove all skin and bones from the fish and chop into chunks and place in the oven proof dish. Sprinkle with the chopped parsley (cilantro) and mix up well. Season the fish mixture with freshly ground sea salt and freshly ground black pepper. Pour the sauce over the fish. Top with the mashed potato and then sprinkle the cheese over the top of the potato. Place in the centre of the oven for 30 minutes or until the sauce is bubbling around the edge of the dish. Serve with green vegetables, for example peas, broccolli, green beans or a sweet tasting cabbage. cook fish in was frustrating. Virtually all of the sauces available are on the shelf listed as "Pasta Sauces", there are none whatsoever on the fish department shelves. Lemon Artichoke Simmer Sauce. Sounded that it might go with fish. This is produced under the Gia Russa brand name, whoever that is, but that's ok, it was a sauce that could possibly work with my fish pie. Ingredients check showed no cheese in it. YAY!! 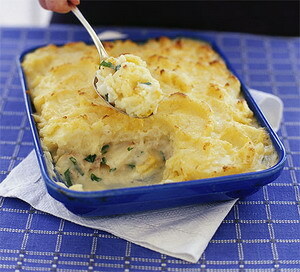 Don't get me wrong, I like cheese, but in a fish pie that has cheese on the top, you don't need cheese IN it too.